Friday, June 27, was a day of contemplation for World Cup players and fans. Here in the U.S., we nursed tattered emotions in the wake of Thursday’s game against Germany. We didn’t win, but we held “Die Mannschaft” to a single point on a sodden field in the rain, taking second place in the “Group of Death” to advance to the next round. (The German team’s nickname speaks volumes–“Die Mannschaft” simply means “The Team,” which as any New Yorker knows is the kind of nickname that intimidates just about everyone into awe or outspoken defensiveness.) In my house, we got so worked up during the nearly two weeks leading up to Thursday’s game that we could hardly eat our burrito bowls at kickoff time. We woke up on Friday morning drained to a sort of meditative quiet. Kind of like a Friday during Lent. So it was appropriate that my mom, who lives next door and still commands significant control of the groceries, ordered fish for dinner. She’s been down with a nasty summer flu, and didn’t feel up to the errand. She called to ask me to pick it up. A bit of background to this. My mom has given the fishmonger so much excellent business over the last thirty-five years, what with regular orders of grouper, snapper, striped bass, and tuna every Friday, in addition to birthday lobster-bakes, and holiday orders that include all the fixings for everything from paella to that crazy Italian “seven fishes” feast you’re supposed to have for Christmas Eve, that the guys at the fish market treat her like royalty. When they spot her pulling up in her claret Lexus, they line themselves up at the counter like the waiters in the “Hello Dolly” restaurant scene, jostling each other to serve her and leaving other customers’ orders half-cleaned. My mom can’t just show up there not feeling her best. Her arrival at the fish market is an event. Me, I’m just the daughter. I can buy fish in cutoffs and flip-flops with dirty hair in a baseball cap, even wan-faced and drooping from World Cup exhaustion, without raising eyebrows. So, my mom sent me. I’d been catching up on work that could not get done on the Day of Die Mannschaft, slouching around in a tropical caftan, drinking lots of green tea (which is supposed to help keep you from developing the kind of body that only looks presentable in a caftan). I banged out a last sentence, hopped into some underpants, and drove to the fish market for the kind of low-key exchange you usually expect when you pick up food for your mom. The man hands you some stuff, you hand the man some money. Just like we learned from Sesame Street. Apparently the fishmonger knows my car, as Great Britain’s citizens may well know Prince William’s. There were two ladies ahead of me. One of them was already being served by an assistant, and the second had just stepped up to order scallops. But the counter was already alert to my arrival. As the fishmonger scooped scallops into a plastic container, he turned away from Scallop Lady to me. “Will that be all?” he said. Scallop Lady thought, naturally, that he was talking to her. “It’s okay if you go a little over a pound,” she said. “Um, yes,” I muttered, feeling half-naked in my caftan. The assistant was in the middle of wrapping something for First Lady. He gave his boss a confused look, then appeared to register “Mrs. Miele,” and dropped the half-wrapped thing at once. “Get it bagged!” the fishmonger grunted. He squashed the top onto Scallop Lady’s plastic container. Scallop Lady herself did not utter protest, though she probably gave me as dirty a look as I’d seen other customers give my mother at such moments. I don’t know, because I was too embarrassed to face her. The assistant presented a plastic bag to me. I held up my purse to him. The man hands you some stuff, you hand the man some money. “Umm,” I said again. The assistant looked panicked, maybe because he wanted to get back to serving First Lady, who was probably giving us both a very dirty look. He was saved by the fishmonger waving my purse away. 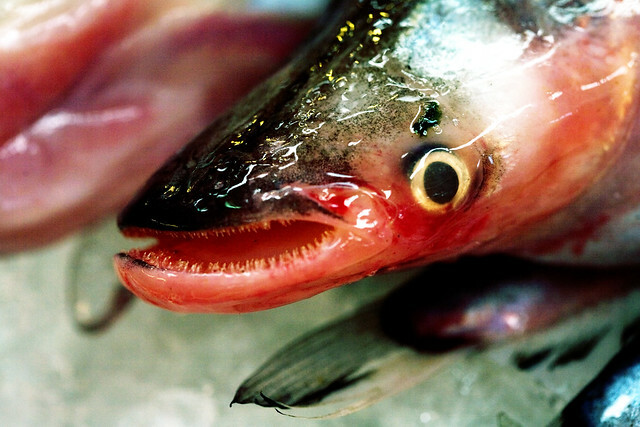 “It’s not your mother’s week to pay,” the fishmonger said, or something like that. Wow. Whose mother has terms with the fishmonger? Like Mario Battali, or Rachael Ray. I scooted out of the fish market, breathless, without looking back. I was mortified, but also secretly pleased. Exhilarated in that guilty, furtive way you get from peeing in the ocean. I sort of wondered whether the experience would have been heightened if I’d not bothered with my underpants. I’m finishing this column on a Saturday morning, refreshed from my day off of soccer. On Friday, laundry got done, the children got fed a healthy meal, and my husband and I even took a stroll at the local middle school’s well-maintained track, while in the field at the center, our 10-year old took shots on goal against his 19-year old brother. I’m rested and ready for more. The U.S. doesn’t play until next Tuesday, against Belgium, but there’s plenty to agonize over this afternoon. Can one really root for Brazil over Chile in the knockout rounds, given Chile’s amazing performance during group play? And of course we’re for Colombia over Uruguay, those bite-supporting monsters, but oh hellish vision, what if Uruguay wins? The sudden shivery thrill of amorality at the fish market is probably unrelated to my World Cup fever, let’s face it. I’m just eager to get back to the thrill of every goal, the euphoria of international play on a World Cup scale. The Americas hold dominant places in the final rounds and two African teams are significant contenders. As U.S. fans, we can also take rare, well-earned pride in our performance thus far in this particular international competition. We had to qualify, for one thing, instead of just landing somewhere with the best equipment and our usual slack-limbed swagger. 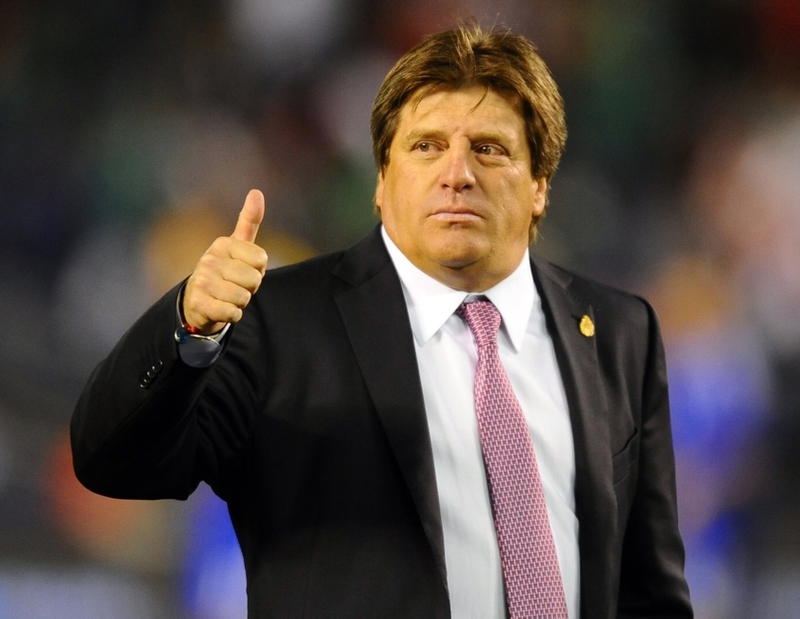 Mexican coach Miguel Herrera illustrates the kind of transformation that World Cup soccer can wreak on a person. Most of the time, he looks like a pretty normal person. When his team scores, he goes understandably bonkers. But when they win, he looks like this. And if you need a metaphor to inspire your national pride, consider U.S. Captain Clint Dempsey’s rhino-sacrificial performance. In the U.S.’s first Group of Death game, Dempsey played the full 90 minutes and led us to victory against long-time rival Ghana even after breaking his nose in the first half. Dempsey went on to play the full 90 minutes against both Portugal and Germany, proving instrumental in getting the U.S. to the second round, despite the delicate location of his injury, not to mention what must have been head-splitting pain. There may be other contenders, but I suspect that Clint Dempsey will prove to be the Magnificent Nose of the year. Photo by Charles Haynes, via Flickr. Next Post What’s With All the “Giver” Hate?